Before the 2018 New Year’s Eve ball dropped over Times Square, Taylor Swift’s Reputation Stadium Tour was already setting out to break records. It grossed $180 Million within the first four days of ticket sales. StubHub has revealed the tour is the best-selling female tour of 2018 in the UK. In the Garden State, Taylor Swift made history this Summer. She is the first woman to headline three consecutive nights at MetLife Stadium with her run from July 20-22, 2018. Records aside, Taylor Swift’s Reputation Stadium Tour does in fact live up to the hype. The tour kicked off in May in Glendale, Arizona and is set to end in November in Tokyo. The show set list contains tracks almost exclusively from Swift’s most recent efforts Reputation and 1989. Critics were initially alarmed. Gone were many of the earlier staples, which made Swift’s career what it is today, ala “Teardrops on my Guitar” (Taylor Swift), “Mine” (Speak Now) and “I Knew You Were Trouble” (Red). Not even all of 1989’s hits were included, as “Wildest Dreams” and “New Romantics” were noticeably absent. But, as the concert kicks off, and certainly by the time the show wraps up, it becomes evident the Reputation Stadium Tour is better this way. Concert-goers will get a stronger appreciation for Reputation’s music. By limiting the set list to recent material, attendees depart with renewed respect for Swift as a vocalist, songwriter, and multi-instrumentalist. Taylor Swift’s Reputation Stadium Tour garners your attention before Swift even takes the stage. It features multiple opening acts. They are large enough to carry their own arena show, albeit not yet stadium status. Charli XCX kicks off the star-studded spectacular with her biggest solo hit to date, the Top 10 Multiplatinum “Boom Clap.” It immediately sets the invigorating precedent for the evening. The further Charli XCX goes into her set list, the clearer it becomes that the songstress has far more hits under her belt. We hear her performances of the 7x Platinum collaboration with Iggy Azaela “Fancy” and 4x Platinum collaboration with Icona Pop “I love It.” Subsequent tracks include fan favorites “Break the Rules” and “Boys.” Charli XCX performs a solid set and definitely amasses new fans. The only slight is the absence of “Girls,” her summer collaboration with Rita Ora, Cardi B and Bebe Rexha, which is not included. During the rain-soaked July 21 show at MetLife Stadium, Camila Cabello noted the added emotions the day’s weather had on her performance. “It has always been my dream to perform this song in the rain,” she said. She was adorned in a modest NY Giants t-shirt paying homage to the venue’s biggest sports team. Cabello closed out her set with a powerhouse performance of “Havana.” Let it be known that the girl group standout turned solo artist is certainly going places. She is on her way to headlining her own stadium tour sooner than later. 1 hour and 45 minutes after the opening acts is when Taylor Swift makes her way to the stage. As the screams and excitement from the crowd begins to increase in a darkened stadium, the chanting of Taylor can be heard. “Baby let the games begin…” Then, atmospheric smoke begins to shoot up from all areas of the stages as the lighting effects ensue. 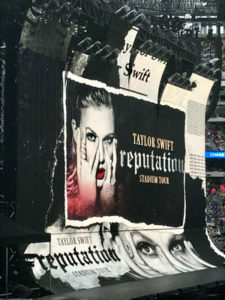 It reveals Taylor and background on the main stage and displayed on all screens in what easily proves to be her best opening performance of any tour to date. 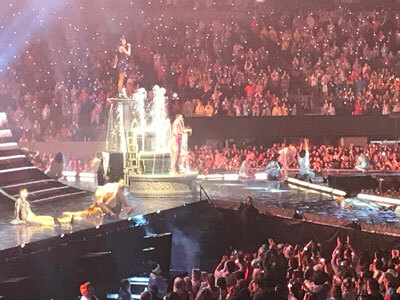 By the end of the first act, which also features “Gorgeous” and a medley of “Style,” “Love Story,” and “You Belong with Me,” attendees are in awe at the attention to detail paid to all visual elements and production. Although pre-tour criticism presumed Swift would not be able to top the critically acclaimed 1989 World Tour — think again. Act 2 opens up with what may be the most exhilarating segment of the show with “Look What You Made Me Do,” as the emotion in Taylor’s vocals and body language parallel the personal message of the song. The track begins with dancers literally dancing on a moving tilted stage per the lyrics. As the performance progresses, a massive 50-foot-tall faux cobra emerges from the main stage. This performance captures the core meaning of the Reputation album, which despite initially being deemed polarizing by critics, is ironically her most relatable album to date. This is proven by the stellar success of the accompanying tour. Listeners connect with the Reputation cuts as, at the end of the day, how you are perceived plays a major role in your progression in life. Moreover, when you face having your reputation tarnished by uncouth characters no less, in Swift’s case the indecorous Kim Kardashian and her avid pro-Trump husband Kanye West, it can place you in a highly vulnerable position. Taylor Swift opens Act 3 with her current single, “Delicate,” and during the stormy July 21, 2018 East Rutherford performance, she shared a special moment with her New Jersey audience. “I just found out backstage that “Delicate” is the #1 song in the country right now,” she said. She praised her fans for their devoted support as she made her way into a chariot-esque platform, effortlessly belting out the hit as she is whisked away midair from one stage to another. The climax of the evening takes place when Charli XCX and Camila Cabello join Swift for “Shake It Off.” The grandiose elements continue into Act 4 with “Bad Blood,” when Swift performs inside a large snake structure midair making her way around the stadium for a majority of the song. 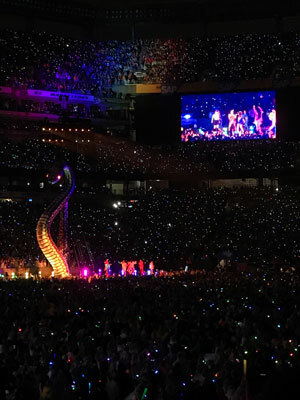 Attendees won’t forget it either, as despite a torrential storm in an outdoor stadium concert, Swift’s vocals, dancing and participation never once floundered. Taylor Swift’s Reputation Stadium Tour tickets are available at www.TaylorSwift.com or Ticketmaster.